Q. What is the Arkansas IOLTA Program? What does it have to do with my client’s money? A. The Supreme Court of Arkansas created the Arkansas IOLTA program in 1984, In Re IOLTA, 283 Ark. 252, 675 S.W.2d 335 (1984), to provide funds for legal services to the poor, projects that improve the administration of justice and legal education. The program was administered by the Arkansas IOLTA Foundation, Inc., which merged with the Arkansas Access to Justice Foundation in 2014. Under the program, interest is paid on nominal or short-term trust deposits held in a lawyer’s or law firm’s client trust account, with the interest remitted directly by the financial institution to the Arkansas Access to Justice Foundation. In October of 1994, the Arkansas Supreme Court modified Arkansas Model Rule of Professional Conduct 1.15 to make the previously voluntary IOLTA program mandatory for lawyers who handle qualifying funds. Q. Who must maintain a client trust account? A. Arkansas lawyers and law firms that receive, maintain, or disburse client or third-party funds. Q. Who is exempt from maintaining a client trust account? A. Attorneys who do not handle client or third-party funds, including full-time judges, government and military attorneys, in-house counsel, and attorneys who are actively licensed but do not practice; attorneys who are licensed in Arkansas but primarily practice in another state and are in compliance with that state’s IOLTA rules; and attorneys who are retired or inactive. Attorneys who are exempt from maintaining an IOLTA account must still annually certify their compliance to the Clerk of the Arkansas Supreme Court. Q. I am an Arkansas-licensed attorney and I represent Arkansas clients, but my office is outside the state. Where should I keep my IOLTA account? A. According to Rule 1.15, client funds must be maintained in a trust account “in the state where the lawyer’s office is situated, or elsewhere with the consent of the client.” An attorney whose office is situated in another state, but who represents Arkansas clients may establish a trust account for her Arkansas clients in her state if the financial institution meets the definition of an “eligible institution” under Rule 1.15, if the institution is approved by the Office of the Committee on Professional Conduct, and if the institution remits the interest earned on the account to the Arkansas IOLTA Foundation. If there is any question regarding whether the account should be opened in Arkansas or another state, the lawyer should obtain the consent of her clients. Q. What duties do I have with respect to retention of client funds? A. The Arkansas Model Rules of Professional Conduct require an attorney to hold clients’ funds in an account separate from the attorney’s firm operating account. Rule 1.15 requires that all funds be held at interest, with the interest payable either to the client or to the Arkansas Access to Justice Foundation. To comply with their ethical obligation, attorneys must place clients’ funds (such as proceeds from settlements, filing fees, retainers, etc.) in the lawyer’s client trust account until distribution. For client deposits that are large enough or to be held for a long enough period of time to warrant the cost of administering an individual account, lawyers are obligated to set up a separate interest-bearing account for the benefit of the individual client. Generally, however, the deposits are not large enough or held long enough to generate interest that would offset the costs of maintaining a separate account. Consequently, attorneys routinely pool clients’ funds in a single client trust account. Neither the attorney nor the client can receive interest, so the interest is paid to the Arkansas Access to Justice Foundation to support law-related, charitable and educational activities. Q. I would like to accept credit card payments from my clients. How can I do this in a way that allows me to avoid commingling client funds with those on deposit in my operating account and allows me to make client funds available "upon request and without delay," as required by Rule 1.15? A. It is never permissible for an attorney to deposit client funds in the firm’s operating account, even if the attorney intends to immediately transfer those funds to an IOLTA account. In addition, issues arise if credit card payments are linked directly to the IOLTA account, as these transactions are subject to merchant fees and “chargebacks” that could result in invasion of the principal of other client funds. Some credit card processors offer programs that address these issues by crediting funds that belong in an IOLTA account to that account and debiting any fees or chargebacks to the firm’s operating account. Before entering into a merchant services agreement with a credit card company, you should make sure that the company can accommodate requirements specific to IOLTA accounts. Q. May I place my clients’ funds in an interest-bearing account and keep the interest? A. No. Such practice is unethical. A lawyer cannot derive any benefit from clients’ property. Q. Does participation in the program deprive my clients of their money? A. No. The program does not use interest money from all client trust deposits – only those that are nominal in amount or to be held for a short period of time. No client is deprived of any practicable income opportunity. If these deposits were placed in separate, interest bearing accounts, the administrative costs to the law firm and the service charges of the financial institution – coupled with the resulting tax liability to the client – would more than offset any income earned. Q. Can lawyers still deposit individual clients’ funds into separate interest-bearing accounts for the benefit of individual clients? A. Absolutely. Lawyers should continue to establish separate, interest-bearing accounts for individual client’s funds where the sum is large enough or when the time of the deposit is of sufficient duration to justify the cost of opening, closing and administering the account. Any interest accrued then becomes the property of the client. Q. Where should a lawyer draw the line between which funds can be deposited in a separate account for an individual client and which funds should be deposited in the firm’s IOLTA account? A. This is – and always has been – solely a matter of the lawyer’s sound discretion. It is up to the lawyer to determine whether the amount of interest an account will generate justifies the expense of opening and maintaining a separate account for the client. Q. Are banks required to offer IOLTA accounts? A. No. But Arkansas banks have shown a strong desire to serve the lawyers in their community. The vast majority of banks not only offer IOLTA accounts, they also waive all service charges and fees on them. This support and generosity enables the Foundation to pay out more money in grants. For a list of our “Preferred Banks”, which offer the most competitive rates and terms, see the IOLTA Banks page. Q. What if my bank refuses to open an IOLTA account for my practice? A. Should a lawyer’s bank refuse to offer an IOLTA account, then the attorney will need to move his or her trust account to a bank that does offer IOLTA accounts. A list of banks in Arkansas that offer IOLTA accounts can be found the IOLTA Banks page. Q. Do different financial institutions have different fee schedules and interest rates for IOLTA accounts? A. Yes. Interest rates and service charges vary from bank to bank and even among different bank branches. Preferred banks are financial institutions which currently pay competitive interest rates on IOLTA accounts and waive all fees. Participating attorneys can support the IOLTA Program’s mission of making funds available to support legal aid for the indigent by doing business with our preferred banks or encouraging their bank to contact us about becoming a preferred bank. The full list of preferred banks can be found the IOLTA Banks page. Q. What fees may a bank charge my account? Which charges am I responsible for, and which are paid by the Foundation? The majority of participating financial institutions in Arkansas waive fees on IOLTA accounts. Banks are permitted to charge, and the Foundation will cover, customary, routine account maintenance charges assessed against IOLTA accounts. Those fees may not exceed those charged to non-IOLTA customers on accounts of the same class within the same institution. These charges may include monthly maintenance fees, per-check or per-deposit charges, and “reasonable” IOLTA remittance fees to defray the depository institutions costs attributable to calculating and remitting the interest to the Foundation. Fees for wire transfers, insufficient funds, bad checks, stop payment, account reconciliation, negative collected balances, and check printing are not covered by the Foundation. Our preferred banks offer waiver of fees on IOLTA accounts and competitive rates, for a list of these banks, see the IOLTA Banks page. Q. How does FDIC insurance work for my IOLTA account if the total balance exceeds $250,000? A. Effective January 1, 2013, IOLTA accounts are subject to a $250,000 limit per client, per financial institution, provided that the attorney or firm that holds the funds has designated the account as a trust account and has properly accounted for each individual client’s funds. Attorneys should be aware that the $250,000 may include amounts that the attorney has on deposit for the client, as well as any funds that the client may individually hold at that same institution. Q. How much of my time and money does maintaining an IOLTA account involve? A. Very little time and no money. The mechanics of establishing an IOLTA account are simple and, once it is done, no further time or effort by the attorney is required unless the attorney changes banks. After the lawyer completes the one-page form, the IOLTA staff handles all the paperwork with the bank. Once the account begins earning interest, the lawyer should periodically review IOLTA account bank statements to ensure that any interest earned is being timely debited. Any changes or fees associated specifically with having an IOLTA account are paid by the Foundation. Lawyers pay for check printing and fees not specifically related to having an IOLTA account, such as wire transfers and check overdraft charges. Q. Do I have to notify my clients that their funds will be placed in an IOLTA account? A. The Arkansas Supreme Court requires that clients be given an opportunity to know about IOLTA. To that end, the Foundation supplies each law firm with a notice that should be posted in a conspicuous place in your law office. Attorneys may also consider including language in client engagement agreements advising that funds will be placed in an IOLTA account. Q. I have a client for whom I was able to win a small settlement several years ago, but I haven’t been able to locate him. What do I do with the money? “(1) When a lawyer, law firm, or estate of a deceased lawyer cannot, using reasonable efforts, identify or locate the owner of funds in its Arkansas IOLTA or non-IOLTA trust account for a period of at least two (2) years, it shall pay the funds to the Arkansas Access to Justice Foundation. At the time such funds are remitted, the lawyer shall submit to the Arkansas Access to Justice Foundation and the Office of the Committee on Professional Conduct the name and last known address of each person appearing from the lawyer’s or law firm’s records to be entitled to the funds, if known; a description of the efforts undertaken to identify or locate the owner; and the amount of any unclaimed or unidentified funds. To remit funds to the Access to Justice Foundation pursuant to Rule 1.15(c), use the form found the IOLTA Forms page. Q. What are the tax consequences of IOLTA accounts? A. There are none. According to the Internal Revenue Service, interest income that is earned on pooled accounts containing clients’ nominal or short-term funds held by lawyers and paid over to the Foundation pursuant to an order of the Arkansas Supreme Court is not includable in the gross income of either the clients or the lawyers. (IRS Rev. Rul. 81-209). The interest belongs to and is paid directly to the Foundation, a nonprofit corporation, so there are no tax consequences. The Foundation’s tax identification number is used, and the interest is paid by the financial institution directly to the Foundation. Attorneys that accept credit card payments should be aware that credit card transactions may be subject to a 28% withholding penalty if the name of the attorney or firm on the credit card merchant services account does not exactly match the name associated with the tax ID number on file with the IRS. Unlike an IOLTA account, a firm’s credit card merchant services account should be set up using the firm’s own tax ID number. Q. How do I set up an IOLTA account? A. Visit the IOLTA Forms page to find the paperwork needed to set up the account. Take the paperwork with you to the bank and ask their staff to complete the information once the account is established. Please note that the account must be interest-bearing and be established using the Foundation’s Tax ID number. It is your responsibility to ensure that a copy of the completed paperwork is provided to the Foundation by email or by fax to 501-682-9415. If you or the institution that you are working with have questions about the process, feel free to contact us at 501-682-9421. Q. How is the program enforced? A. Arkansas lawyers must certify annually to the Clerk of the Arkansas Supreme Court that they have compiled with Rule 1.15. If a lawyer or law firm has not complied with Rule 1.15, the lawyer will be referred to the Supreme Court Committee on Professional Conduct for investigation. Q. 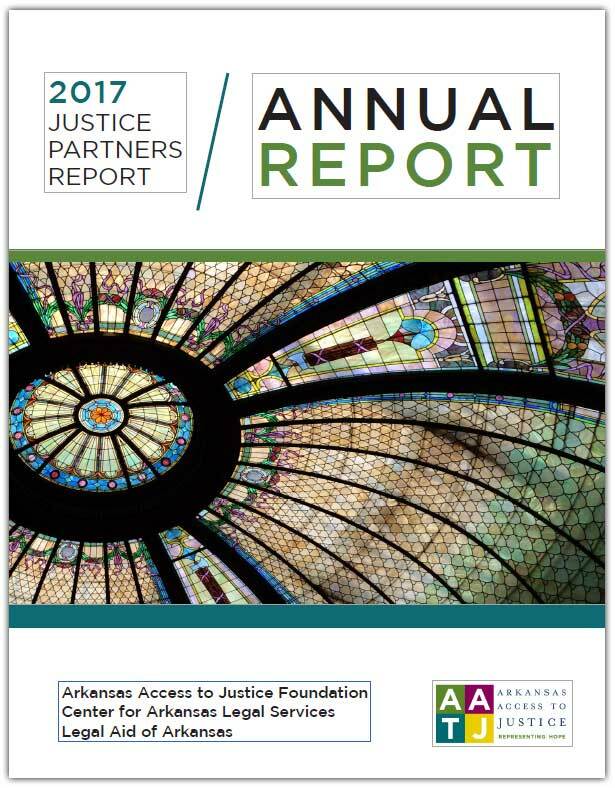 How does the Arkansas Access to Justice Foundation use the interest? A. The Foundation disburses the funds to organizations that meet its mission of increasing access to justice, including Legal Aid of Arkansas, the Center for Arkansas Legal Services, and the Arkansas Access to Justice Commission. Q. Where do I send my IOLTA Compliance Statement that I receive with my bar license renewal form? A. IOLTA Compliance Statements should be returned along with bar license fees to the Clerk of the Arkansas Supreme Court, 625 Marshall St., Little Rock, AR 72201, and NOT to the Foundation. IOLTA program staff can, however, assist in answering questions about exemption categories or pro bono reporting. If an attorney’s status changes during the year such that he or she ceases handling client funds or begins handling client funds, Compliance Statements may, at that time, be provided to the Foundation.